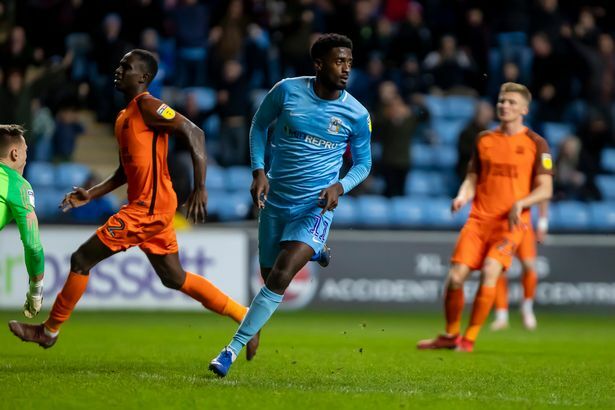 Jordy Hiwula backed up his Boxing Day goal with another strike to help Coventry City to brilliant back-to-back wins at the Ricoh Arena. The 24-year-old showed great composure to slot past Southend United’s keeper early in the second half to give the Sky Blues a deserved lead against their fellow mid-table rivals. And despite an attempted fight-back from the Shrimpers, Mark Robins’s men held on to their slender lead to see out the game in eight minutes of stoppage time to leap-frog their fellow mid-table side to reassert themselves in the top half of the League One table, up to ninth place. It was a scrappy first half where City clearly missed the attacking spark of the injured Luke Thomas, replaced by midfielder Zain Westrooke who took responsibility for set-piece duties on an encouraging league debut for the club. Chances were few and far between to the break with Conor Chaplin going close after 25 minutes when he got on the end of a Dujon Sterling cross but saw his impressive header deflected wide. Southend were a big and physical side and City looked vulnerable, again, from set-pieces as centre-back John White headed narrowly over for the visitors from the first corner of the game. Chaplin went close again just before half-time when he cut in onto his right foot and had the keeper at full stretch with a shot that flew narrowly wide of the far post. Coventry started the second half a lot brighter, clearly motivated by their half-time team talk and wasted little time in getting the goal that had eluded them in the opening 45 minutes. It came after a decent spell of pressure in the final third that saw Tom Bayliss turn smartly outside the box and slip the ball in to Hiwula who timed his run to perfection to beat the off-side trap. Clean through on goal, the striker hit his shot early and slotted past the out-rushing keeper to give the Sky Blues the 54th minute lead. The striker, however, was forced to move out wide minutes later when Jordan Shipley limped off injured and was replaced by centre-forward Jonson Clarke-Harris who played down the middle. Southend attempted a fight-back with Elvis Bwomono blazing over the bar and striker Simon Cox missing a great chance to get his side back on level terms when he fired across the face of the City goal. Robins was forced to make late changes when the neat and tidy Westbrooke started to cramp up, replaced by the returning Michael Doyle, while teenage left-back Sam McCallum went on for the tiring Brandon Mason to make his league debut for the club. The game ran into eight nervously long minutes of added time after Liam Kelly had received treatment for a head injury, during which time City desperately defended three corners in quick succession – Lee Burge punching two clear and making a last ditch save to deny Harry Bunn at the death in an agonising end to the game.